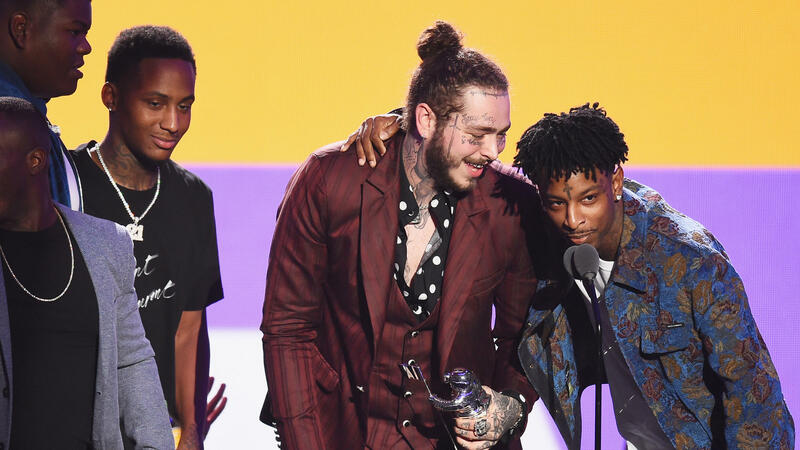 21 Savage, far right, and Post Malone on Aug. 20, 2018, during the 2018 MTV Video Music Awards at Radio City Music Hall. "As a minor, his family overstayed their work visas, and he, like almost two million other children, was left without legal status through no fault of his own," Charles H. Kuck, a lawyer for Abraham-Joseph, said in a statement issued Monday. In a separate statement issued Tuesday, Abraham-Joseph's representatives explicitly compared his situation to the roughly 700,000 young people who are legally in the U.S. because of the Deferred Action for Childhood Arrivals program, or DACA. The Trump administration's attempts to repeal DACA have been blocked repeatedly in court. "These 'Dreamers' come from all walks of life and every ethnicity," the Tuesday statement says. Kuck explained that his client "has never hidden his immigration status from the U.S. government" and that Abraham-Joseph filed for a U Visa in 2017 — "yet they took no action against him until this past weekend." U Visas, which are capped at 10,000 approvals per year, were created in 2000 as part of the Victims of Trafficking and Violence Prevention Act. Nick Valencia, the CNN reporter who broke the news of Abraham-Joseph's detainment on Sunday, quoted an ICE spokesperson as saying that the rapper's "whole public persona is false," a statement presumably pointed at the rapper's lyrical references to growing up in Atlanta. A spokesperson for ICE declined to comment on his detention when reached Monday and did not respond to requests for clarification on Tuesday. The statement from Abraham-Joseph's representatives also claims he has "no criminal convictions or charges under state or federal law," which would bolster his case for release while his 2017 visa application is processed. Kuck's Monday statement asserted his client's detention was based on "incorrect information" about previous drug charges. Last June, a GQ profile of the rapper mentioned a previous arrest on "serious felony drug charges," which the artist directly addressed in the interview, but a representative for Abraham-Joseph did not immediately respond to a request for clarification. "Enforcement priorities under the Trump administration are dramatically different from what they used to be," says Leena Khandwala, a supervising attorney for the Legal Aid Society's immigration unit. "There was a much more concerted effort in the past to go after individuals that fit a certain profile. And it seems he wouldn't fit that profile of an enforcement priority. Given that he seems to have no criminal history, he wouldn't be a priority. ICE doesn't, though it pretends to, have the resources to go after everyone identified in Trump's enforcement priority memo." As his representatives' Tuesday statement points out, 21 Savage changed the lyrics to his hit song "A Lot" last week during an appearance on The Tonight Show to address the Flint water crisis and the detention of children at the border: "I can't imagine my kids stuck at the border / Flint still need water / People was innocent, couldn't get lawyers." (At least four lawsuits have been filed against ICE over its treatment of children being held at its facilities.) Abraham-Joseph's lawyers insinuated that the changed lyric may have been a factor in his detention. Abraham-Joseph's latest album as 21 Savage, I Am > I Was, spent the first two weeks of 2019 at the top of the Billboard 200 album chart. His collaboration with Post Malone, "Rockstar," currently counts 1.4 billion plays on Spotify and spent eight weeks at No. 1 on the Billboard Hot 100. The song is nominated for two Grammys, including the awards' top prize, record of the year. An online petition organized by Black Lives Matter co-founder Patrisse Cullors calling for Abraham-Joseph's immediate release had drawn more than 191,000 signatures by Tuesday evening. The petition asks ICE to "allow him to petition his case from home," which it can do by approving an application for bond.